We provide Authorized Repair, Sales, Maintenance and Field Service on industrial electronic equipment nationwide. VFD Drive Repair, VFD Drives Sales. We have a regional sales force covering Texas, Oklahoma, Arkansas, Louisiana, Southern Missouri and New Mexico, but we can sell and repair onsite nation wide. Quality Repairs: Our electronic technicians and engineers are fully trained to use the latest technology to test and repair your industrial electronic equipment. We have the capability to repair your circuit boards down to component level. We have the capability to load test your drives and VFD’s up to 100 horsepower and your power supplies to 200 amps in our custom-built load bank room. Larger drives and equipment can be load simulated. Specialized Electronic Services offers a 6 month warranty from the date of installation on most repaired items. We have many Years of Experience working on industrial equipment and have done extensive training on many AC drives, DC drives, and servo drives. We offer technical support over the phone as well, for items we have sold or repaired for our customers. Fast Turnaround Time: Specialized Electronic Services completes most repairs in 8-10 business days; faster than industry standards. Rush services are also available for an additional fee. In our repair facility, not only can we provide you some of the fastest turnaround times at prices below most of our competitors. A “rush service” is also available. For a nominal fee we can expedite your repair to sometimes within 24 hours. Since we stock a large inventory of parts some repairs can be accomplished in as little as 24 Hours. If parts need to be ordered in, the repair can be done in two to three days. Occasionally, in the case of older obsolete parts, a rush repair is not feasible. We will advise you when this is the case, and can offer repair as soon as the parts are expedited in. Be sure to mention if you need our rush service in your correspondence with us. Timely Quotations: We offer quotes on most items received for repair within 24 hours. And there is no evaluation fee for the quote. Call us today at 1-800-681-7374 for quotes. 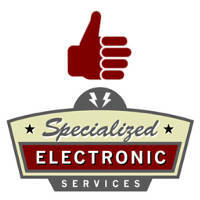 At Specialized Electronic Services, we have Factory Trained Technicians available for your industrial electronic needs. We are factory authorized representatives for many leading brands in the industrial field. Whether it’s AC Drives, Spindle Drives, DC drives, Servo Drives, PLC cards, or circuit board repairs, we have the training and ability to do the job right the first time. We have over 50 factory authorized training certificates and we are an Official Warranty Service Center for many AC, DC and servo drive manufacturers. Our staff keeps training so we can help you with the latest industrial electronics upgrades and retrofits in your facility. Call us today for your industrial electronic needs. Load Tested Repairs: At Specialized Electronics we can put a load on your AC drive or DC drive after we repair it, up to 100HP. We have motors that we tie together to buck each other when we test your AC or DC drive when the repair department is done with the repair. If a drive comes in for repair be it an AC drive, DC drive, Servo drive, or Spindle drive and it is uneconomical to repair or if it can’t be repaired due to obsolete parts we can usually get you a quote for a new drive that will work in its place. Our sales department will work with you on getting you the proper drive to retrofit into your system if your old drive is obsolete. If your drive is still currently available we will quote you with the same drive.